When it comes to spirituality, often much attention is given to Eastern spirituality. At the same time we have in the West a spiritual tradition that is millennia old. At the core, NLP is a method to chart human behaviour. Usually NLP is used to identify (a) how to get people out of trouble, (b) become better communicators and (c) sales. What Licensed NLP Master Trainer™ Joost van der Leij has done is to translate all kinds of different development programs of many magickal societies into smart NLP. In particular, this concerns the Tao, the Kabbalah and Yoga. That whole has become NLP Magick. how to activate the five Kabbalistic energy centres in your body so you’re more yourself, communicate better, love more, be able to create more and stand with your feet on the ground. 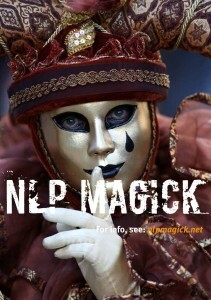 More information can be found at our specialist website for NLP Magick.